Hello! Teacher Sydney here! I thought I would chat about how to start teaching for VIPKid on limited funds. You certainly don’t need to spend a ton of money to get hired here! A little bit of background on me: I am a chronically ill grad student with more student loans and medical expenses than I like to think about. When Teacher Erin mentioned VIPKid to me over a year ago, I leapt at the idea! But I had less than $10 in my bank account, how was I ever going to meet all the requirements???? Here is how I managed to set up my classroom on a budget (and the upgrades I have made since then)! Disclaimer: Many of these items I specifically state are things I found around my house! That does not mean that you are stuck if you don’t have these items, I provide alternate suggestions on how to meet these requirements on a budget as well. Still stuck? 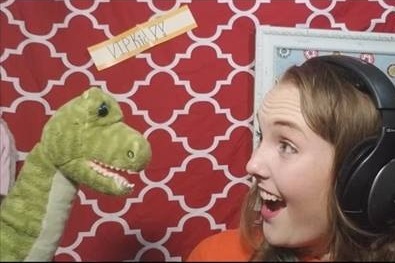 Join our Facebook group VIPKID Hiring Q & A for even more suggestions & assistance, and check out Teacher Erin’s video on what you REALLY need to get you through the VIPKid hiring process! This can be the priciest part of VIPKid. I was somewhat lucky in this department: I already had a laptop with a built-in webcam. I also used my cheap earbuds as headphones for my interview and then borrowed over-the-ear headphones from a friend for my mock classes. I did not use an ethernet cable during this time and instead was sure to reset the router before all interviews/mocks/classes, restart my computer, clear cookies, turn all other devices on airplane mode, etc. to ensure a stable internet connection. I also sat as close to the router as possible (I was sitting at my dining room table at the time). For lighting, I found all of the desk lamps, floor lamps, and track lighting in my house and set them up to point at my face! I eventually figured out that with my overhead lighting, two other lamps in different positions was sufficient. When starting, I did simply use the track pad on my laptop or the touch screen while teaching. You can always check to see if you can borrow technology from friends and family, or even the local library, to help you get started! It doesn’t need to be particularly fancy to help you get hired and teach your first class, as long as it meets VIPKid’s tech requirements! If you are struggling with lighting, you can always use multiple flashlights pointed at different angles in addition to overhead lighting! I have done this before in a pinch or during power outages. If you are getting a harsh circle on your face because of the flashlight, put white paper or tissue in front of it to help diffuse the light. Because of VIPKid, after a few months of teaching I was able to afford to upgrade to a new desktop, external webcam, LED lighting, better headphones, a wireless mouse, and of course an ethernet cable. None of these were strictly necessary, but with how much I teach, it greatly improved my work experience and the student’s learning experience! This was actually one of my favorite parts of gathering things for my classroom! I went through my house to find anything colorful I already owned to potentially use as a background. I found an old colorful magnet board from my days living in a dorm and a brightly colored sheet. Since I was teaching in my kitchen, I put three small finishing nails in my wall: two up high to suspend the sheet on and one part way up the wall to pop through the sheet and hang my magnet board on. This made it super easy to hang up and take back down every morning. I also made a name tag on paper and used rolled scotch tape to hang that on the sheet behind me. And that was it! You can use anything colorful in your house that isn’t too distracting: blankets, sheets, patterned fleece, magnet boards, maps, educational posters, etc. If you do not have any of those things, check your local dollar store for educational posters or world maps. If that isn’t available, most dollar stores will have borders and die cut shapes/images to purchase or you can make your own! If you have a color printer or access to one and would prefer to print and assemble your own background posters, check out this website. There are endless background possibilities and it can be a very simple background without being boring! I have changed out my background a few times since I was hired, but that was only because I moved and now have a dedicated teaching space (no more sheet hanging at 4 AM, yay!). I wouldn’t say my new backgrounds are an “upgrade”, they are just different! There are a couple props you need to get started with VIPKid, so I will break them down into subcategories. I actually used a dog toy that my dogs had taken the liberty of unstuffing for me. I just put my hand inside the now empty toy and voila! Puppet! Alternatively you can unstuff a stuffed animal you have, purchase one at the dollar store or thrift store to unstuff, or learn to make your own sock puppet here. This was my most “creative” solution by far. My dollar store was out of white boards and I couldn’t afford one from another store, so I made my own! I taped a piece of white paper to a piece of cardboard I cut from a box to make it the right size. Then I wrapped the whole thing tightly in clear plastic wrap and taped it along the back. Suddenly, whiteboard! Whenever the plastic wrap started to get dingy or stretch (probably every 2-3 weeks), I would simply take the old stuff off and put on a fresh layer. Honestly, I taught using this makeshift whiteboard for way longer than was necessary, it held up through my first ~500 classes! Luckily we already had a whiteboard marker, or those can be purchased from the dollar store. Using items from around the house is the best way to gather realia for classes! I used a tomato, a ruler (all vocabulary for the hiring process lessons at the time), and other easy to grab items. With today’s mock classes and interviews, some suggestions are a ball, a doll, a small trash can, making your own flags using a printed flag taped to a pencil, etc. This is depending upon which Certification you are trying to obtain. The biggest question people usually ask is about the doll. If I was to retake the mock classes and felt that I needed a doll (and couldn’t borrow one), I would explain to my mock mentor that I didn’t want to buy another prop until after I was hired and ask them to pretend that one of my stuffed animals was a doll for the purpose of the mock class. A lot of people feel like they need to print a bunch of huge props and laminate them, but you don’t! I printed 3 pages of props in color from a local print shop for ~$1. I fit as many as I could on one page, and then before my interview and mock classes I practiced holding them closer to the camera so that they looked bigger. I also pasted some on colorful cards/construction paper I had around the house to make them look a little more professional. I made all of my own letter cards by writing on paper and even drew my own emotion faces for the “My Feelings” interview demo lesson! 2D props do not need to break the bank! I actually haven’t really upgraded my props too much, with the exception of purchasing a real whiteboard! I rely heavily on realia in my classes. I also now own a “real” puppet, but I often use my stuffed animals instead of my puppet. Many teachers enjoy expanding their prop collections, but I find the simplicity and minimalist style much more manageable. I actually used the same reward system for all of my mock classes during the hiring process, regardless of level: die cut party hats from the dollar store. Remember that magnet board I mentioned earlier? I cut up old advertising magnets from pizza places, newspapers, etc. and taped them to the back of my part hats to make them easy to display behind me. You can also draw or print your rewards and cut them out! If you don’t have a magnet board handy, you can also hang a cookie sheet behind you (also found at the dollar store) to put magnets on or skip that entirely! An easy way to stick rewards behind you is to simply roll up a piece of tape (painters tape will ensure non-paint peeling stickage) and stick it to the back of the rewards and then stick them to the wall behind you as you go! I am happy to report I now own more than just one reward system for all levels! I purchased this cool fish Velcro game from IKEA. I also purchased additional die cuts from the dollar store, such as moons and cupcakes. Mostly I rely on my whiteboard to create new rewards for my students! Ah yes, the orange shirt! I actually had an orange V neck shirt that had white writing on the front and was a little too low plunge for VIPKid, so I simply turned it around! Yep, I taught with my shirt on backwards for a few months. The other shirt you see pictured earlier in this blog post belongs to my partner and due to the logo on the pocket, I also wore that one backwards while actually teaching too! Check your local craft stores and retail stores! Michael’s and JoAnn’s usually have safety orange shirts for ~$5. My first shirt I purchased was actually from the boys department at WalMart for ~$3. Hopefully this helps you feel confident in starting your own VIPKid classroom on a budget! I know when I first started I was very daunted by all of the teachers with their cool tech setups and gorgeous backdrops. Just know that it is not a necessity to have all that to start and be successful with this company!